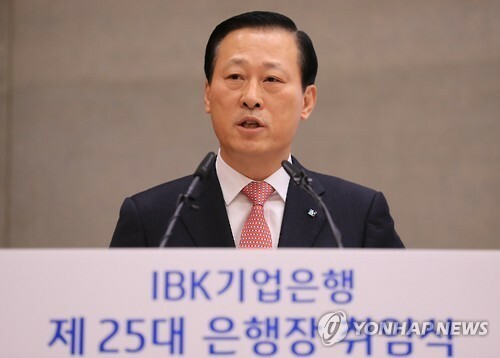 Kim Do-jin, new CEO of the Industrial Bank of Korea, said Wednesday he will focus efforts on diversifying the income source of the state-owned policy lender. Taking up his new post, Kim stressed the need for expanding noninterest revenue and capitalizing on the rapid growth of mobile banking and fintech businesses. "The current financial (business) conditions are like hanging by a thread," he said. "South Korean banks are trapped in a situation that profits do not increase despite a growth in assets. There is no method other than change and innovation to overcome it and secure survival and development." Kim, who served as the Seoul-headquartered bank's senior executive vice president, said he will seek to increase the ratio of overseas profits by tapping aggressively into foreign markets. He also pledged every effort to streamline the management and operation of the IBK. "The IBK has grown in size, but it leaves some to be desired in effectiveness," he pointed out, citing the importance of slimming down cost and organization.